Notice your thoughts and feelings and label them ("I am having the thought that I will never find love" or "I'm having the feeling of sadness over my breakup"). Try not to get caught up in thinking about how much you hate having a difficult thought or worrying that the discomfort associated with this thought will last forever. Just notice the thought, feeling or sensation and then gently redirect your attention back to the present moment. Over time this practice gets easier, and the tough thoughts and feelings will have less of a strong hold over you. 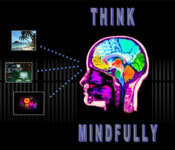 Mindfulness training will assist you in enhancing your ability to disentangle and gain some distance from "sticky" thoughts and feelings that seem to grab at you and take you away from the present moment.